So, this thing — This Work — it calls itself an opera, a work of spectacle and gravitas. But why would a group who perform on television award shows and have their songs selected for global advertising campaigns even bother? This Work begs some questions: in today’s entertainment landscape is their room for operatic spectacles of the old-fashioned kind? Or do such productions need to take on a newfangled form? Or, finally, is something weirder happening — are lots of artists naturally aspiring to create some as-yet-unseen amalgam of old & new? More thoughts about as-yet-unseen amalgams. – “Well, maybe next year I’ll be seated behind Paul Simon,” he said to himself with a sigh. But wait a second, is this kind of spectacle so different from the ones that The Knife have produced collectively and individually? Though Gaga’s means may seem laughable to a sophisticated viewer like Franklin, her ends should not be dismissed by the rest of us. What does this mean? Well, for one thing, if Gaga were to pantomime a lesbian kiss or commit a wardrobe malfunction, you can be damn sure the intended aim would be more than a one-week sales bump for her new single. Beyonce herself is described in this week’s New York Times as “a spokeswoman — usually a dancing and singing one — in commercials for DirecTV, American Express, Wal-Mart and L’Oréal, among others.” So she is multi-platform. But Beyonce’s multi-platform attack is different. It is merely a brand extension, not an extension of her art. 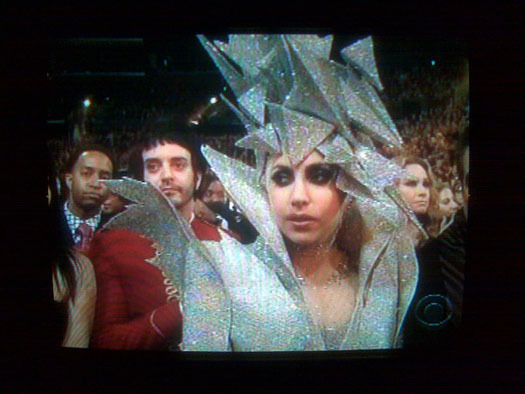 Both Beyonce and Gaga play a sort of vanishing act, hiding their true selves while in the public eye. But whereas Beyonce’s is expressing her vibe as one of self-effacement (modest, attractive, old-school), Gaga’s vibe is more intense. It’s about self-defacement (mostly offputting, ingratiating only because it’s so bizarre, new school). Gaga takes the focus off herself as a person and puts it on This Work that she does. That’s something decidedly new school. Here’s another German compound word to try on: gesamtkunstwerk sometimes defined as a “comprehensive artwork synthesizing all of the arts,” often used in the context of Richard Wagner’s operas. Some say he coined the term. Is that what today’s most ambitious musicians are increasingly — if unconsciously — re-shaping their careers to pursue? 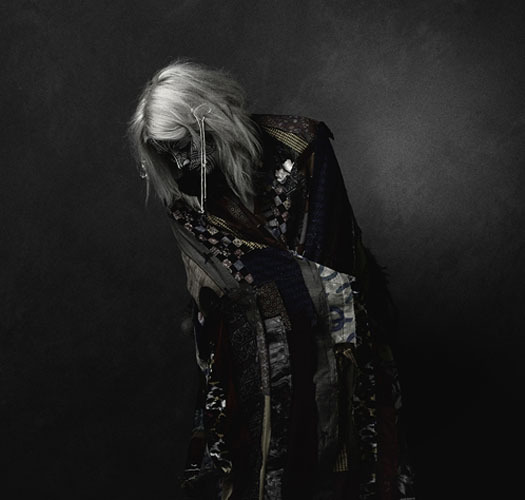 Fever Ray is, for instance, clearly interested in high drama. Here she is striking a Butohesque pose. I saw a version of this a few years back at New York’s Webster Hall. Performing behind a scrim, one got the sense that that the performers actions on stage represented only a fraction of the show. It was as much about the Robert Wilsonesque play of light as it was about the live music. Finally, what both Gaga and Fever Ray are presenting is a more total artwork than pop stars of the past. It doesn’t just encompass music, fashion, theater, and aesthetics; it allows the music to be surpassed by the fashion, theater, and aesthetics. Let’s call these newfangled gesamtkunstwerk(s) The Package. The Package is not a sideshow to the music, nor a piece of flypaper to draw people in, nor a way to highlight a pop star’s real personality. The Package is the thing in and of itself. The Package does not evolve into clothing lines, movie roles & Broadway shows as new levels of popularity are achieved. Rather, furthering The Package is the core creative goal these artists have in mind from the start. The artist, in a way, loses themselves within The Package. 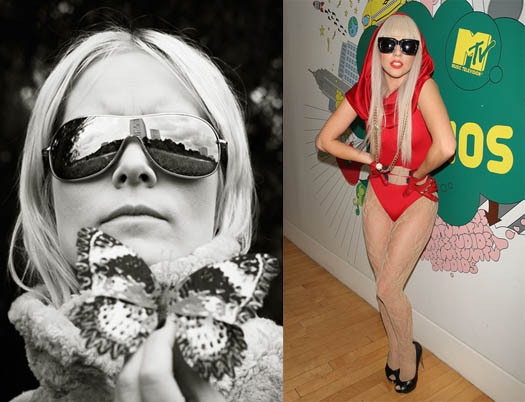 If you really take the time to compare Fever Ray (at left) and Gaga (at right) side-by-side and you’ll be surprised to find they share far more qualities — or a lack of qualities — than you’d expect. As I was saying, sometimes an echo is more than an echo: it’s a conversation happening within the culture, or among cultural practicioners. I’ll close this post as I began it. Here, again, is Drier (at left) winning an award at the Swedish Grammis a few weeks back, alongside Gaga (at right) winning a prize at the MTV Video Music Award this past September. Compare and contrast — that is, if there’s any contrast to be made. Like it or not, Lady Gaga is a powerful force in culture. And, as I was saying, American cultural imperialism is no joke. 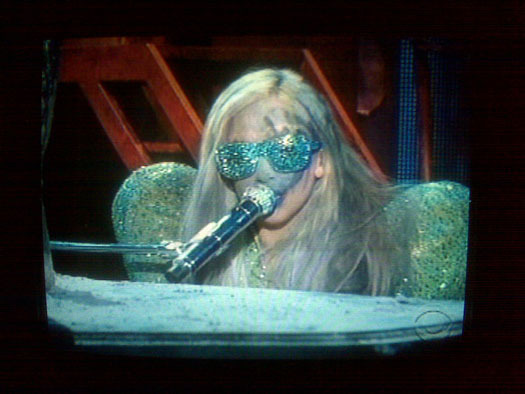 Fever Ray’s appearance was taken by many as parody of Gaga. But every parody has an element of tribute, and perhaps that’s what this was, one cultural innovator tipping her veil to another. UPDATED FEBRUARY 7, 2010: And lest we forget that opera remains a very old school business, on Friday came news that the Metropolitan Opera’s current general manager, Peter Gelb, has brought back the former head, Joseph Volpe, to negotiate the most intractable element of the opera venture: union contracts. Though the handover of power from Volpe to Gelb was reportedly quite contentious, the new school Gelb (a former record industry exec and born impresario — his father was managing editor the New York Times) simply could not do without the old school Volpe (a former master carpenter & impresario only via on-the-job training).